For the last several years, anyone with a gripe about a bank, mortgage lender or student loan servicer has had a place to go. The Consumer Financial Protection Bureau has maintained a giant public database of consumer complaints that contains more than 900,000 grievances against financial companies. But the future of that complaint database is up in the air. Critics have long argued that the bureau's power is too broad and unregulated. The tension came to a head last week when Director Richard Cordray resigned and named a temporary successor from within the bureau. 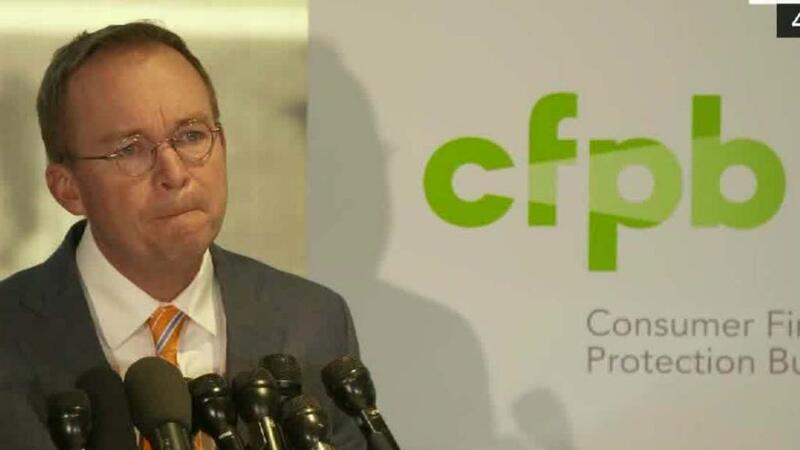 President Trump later announced Mick Mulvaney, the current director of the Office of Management and Budget and frequent CFPB critic, as his pick for acting director. On Sunday, a lawsuit was filed against Trump and Mulvaney, seeking a court order halting Mulvaney's appointment as acting director. While the drama continues to play out about who is leading the watchdog agency, its future remains unclear. Earlier this year, Republican lawmakers introduced legislation to abolish the CFPB altogether. The agency was created in the wake of the Great Recession by the 2010 Dodd-Frank Act to protect consumers against unfair and deceptive practices. It has rulemaking, supervisory and enforcement powers. Consumers can submit complaints about a financial product or service to the CFPB, which then sends them to the company involved. Companies have 15 days to respond. The CFPB claims to have recovered $12 billion in relief for nearly 30 million consumers. It's gone after banks, debt collectors and student loan providers over shady and illegal business practices. Last September it hit Wells Fargo (CBEAX) with a whopping $185 million fine for setting up unauthorized bank accounts. The database plays an important role within the agency to help staff members spot fraudulent practices, identify trends and patterns and prioritize their efforts. It's also helpful to consumers making big financial decisions, researchers and other consumer advocacy groups, she added. "Imagine if the database was available before the great recession and foreclosure crisis," Susswein said. "A lot less damage would have been done."